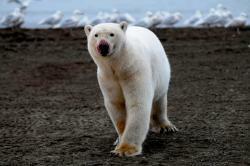 Investigate the problems facing a unique population of polar bears due to climate change. At the heart is an extraordinary event — the annual gathering of up to 80 polar bears on Barter Island in the Arctic Ocean each September. The Great Polar Bear Feast airs Wednesday, June 22, 2016 at 8 p.m. on WXXI-TV.